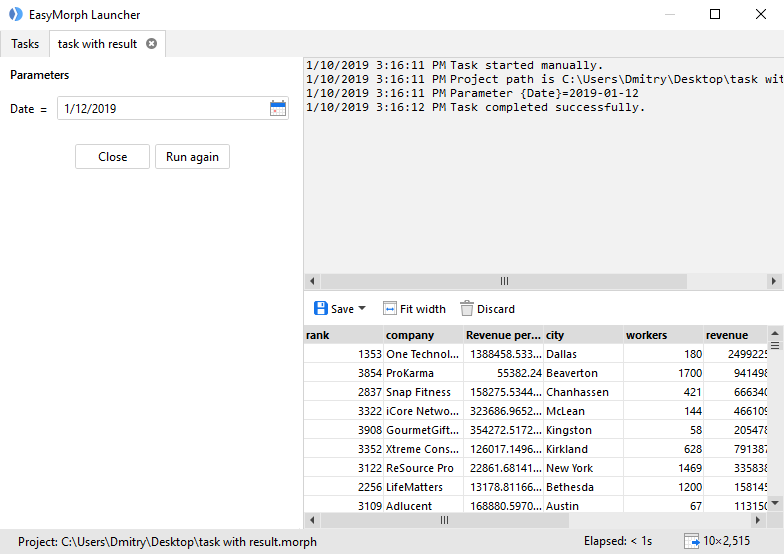 EasyMorph Launcher is a reincarnation of EasyMorph Scheduler which was released two years ago. The reason we didn’t call the new version Scheduler 2.0 but Launcher is that scheduling, while surely useful, might be not its the most interesting function. We see the Launcher as the next step towards our goal of making your work smarter (and life easier) via data-aware automation. With EasyMorph Desktop, our focus has been on convenient designing of workflows. With the Launcher, we make it convenient to use them. EasyMorph Launcher is intended to be a hub for all your automated work routines, big or small. Now you can keep them in one place and trigger with a single click. Do you send the same Excel report to the same group of colleagues every day? One click and the Launcher does it for you. Do you need to perform a usual data quality check for the files that your colleague just put on a network folder? One click and the Launcher not just does it for you, it also shows you the result of this check. Yes, that’s a new thing – the Launcher can display a particular table from a project it just ran. This means that you can design workflows and make the Launcher not only do something for you, but also tell you something. How many orders have been placed today? One click and you know the answer. What are the errors in the log files since yesterday? Click to see them. Sometimes, all you want to know is just a couple numbers or a few words. It may be not worth designing a fancy dashboard and publishing it on a corporate web-portal. We at EasyMorph use the Launcher internally to run tests, update our website, build and publish online new versions of our software and sometimes even for simple tasks like cleaning up the Downloads folder. All in all, EasyMorph Launcher is your personal assistant that can do tedious work for you as well as answer some frequent questions. You can try the Launcher by downloading and installing the latest version of EasyMorph Desktop from our download page. The selected result table is shown after task is finished. Not that the task can be re-launched again right in the task tab, optionally with different parameter values. In case of errors, errors are displayed as rich cards with helper links and buttons. Great feature, and a very welcome addition to the desktop version. I have a number of projects which I run in a sequence. When first project is done, I run the next, then third and so on. This is because results from earlier projects might feed input to following projects. 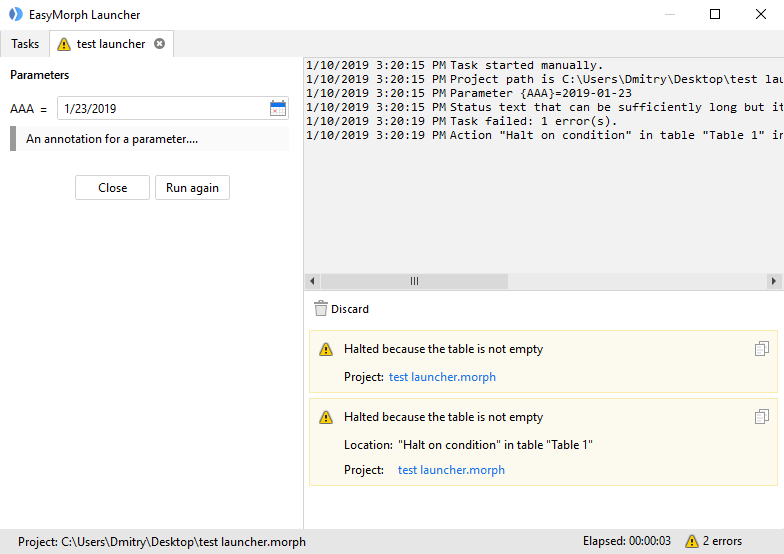 In Launcher I can only run projects independently, meaning I will have to assume the time it takes to run each projects, knowing the time spend per project can vary from session to session, run to run. If I can schedule a project to run at the tail of another scheduled project, be it immediately or with an offset, I can automate a trail of projects with one starting trigger. I’m aware I can combine all related projects in one, sequencing the projects using the synchronize job, and then schedule this but my experience is that the deeper I make each project, (number of project layers), the more complex it is to correct errors. You can check this option in the installer. Am I missing something? Duly noted. Thank you for the example use case description – it helps to understand more details about a feature request. 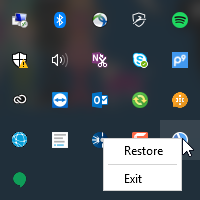 Regarding Start Launcher at Windows Startup - You are right, it is shown at installation. Would be nice though, to be able to control from either settings within the Launcher itself (not available), or by right-clicking on the icon in the tray. It’s coming in the next release. Technically, for each alert it can be a task that runs every N hours (or once a day), evaluates a rule, and sends an email notification. Checking something once in a while? Let the Launcher do it for you. Dmitry, I will be implementing EasyMorph on a trial basis soon. Our basic use case: we are an analytics startup with PowerBI chops, but we’re finding out PowerBI doesn’t play perfectly well with RedShift. Query-in-place may become a necessity for us very quickly, though we expected it to be an optional performance boost later on. I’d like to understand if Launcher is included with the free version of EasyMorph. Is Launcher the right utility to use if one has a regularly-scheduled transformation to perform on a data source and then automatically write or update a new table to your cloud database? The Launcher is included with the free edition of EasyMorph, however the scheduling feature is only enabled in the Professional (paid) edition. In the free edition scheduling is disabled and it’s only possible to trigger tasks manually. Note that you can request a 30-day trial Professional license right from EasyMorph – click “Request trial license” in the Start screen of the application and the trial key will be sent to you automatically. 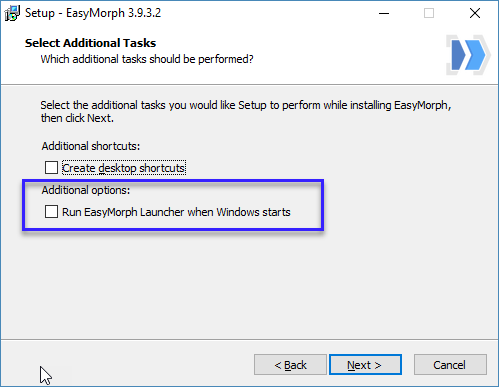 The trial license unlocks all features in EasyMorph, including scheduling in Launcher (you may need to restart the Launcher after the trial license is applied in EasyMorph Desktop). Is Launcher the right utility to use if one has a regularly-scheduled transformation to perform on a data source and then automatically write or update a new table to your cloud database? It depends. The Launcher works as a Windows application and is intended mainly for individual use. It requires the user to be logged in. You can run your transformations and exports on schedule in the Launcher as long as you stay logged in. It may work sufficiently well if you don’t use it for critical tasks. Using the Launcher for critical tasks might be not a good idea as the Launcher can be accidentally stopped for various reasons – e.g. the user session can expire, user can accidentally log off, or Windows Update can initiate a reboot. 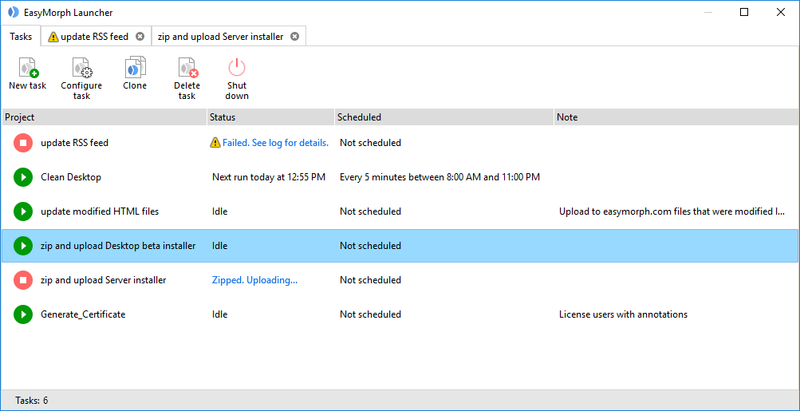 If you need a more robust, production-ready solution, I would recommend scheduling EasyMorph projects using EasyMorph Server. It’s more expensive, but it works as a Windows service (with a web-interface). It means that it’s autonomous, it doesn’t require a user to be logged in, automatically restarts on reboots, and it can be accessed and configured remotely from a web-browser. as we want to receive messages via esb (in future maybe KAFKA), we would like to schedule jobs, so that the start as soon as a new message, file or whatever is ready for progress. Is it possible to change the interval in the launcher to work with “real-time” data? you can use the Continuous schedule to run a task as frequently as every 5 minutes. Note that the Launcher doesn’t have an external API. If you need to trigger tasks externally, you will need EasyMorph Server. We know that we should use the server for this. I am still checking out the possibilities and whether all our requirements can be met by EM.